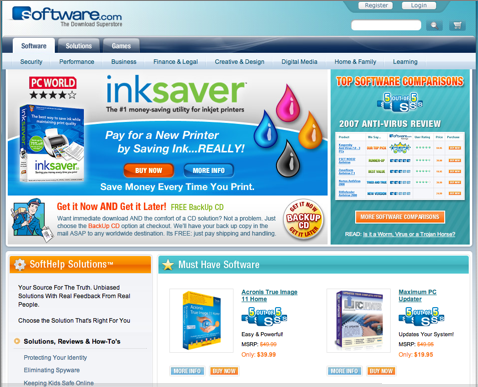 Back in 2000, two mobile software companies with perfectly good names, Phone.com and Software.com, merged in a $6.4 billion deal and became Openwave Systems. The new name was bland and meaningless then—as it is now. (Although, don’t get me wrong, the company itself is perfectly fine —and, in fact, just sold its Musiwave business to Microsoft for $46 million). But Openwave just sat on the Phone.com and Software.com names and URLs for years, doing nothing more with them than redirecting traffic to its corporate Website. Nearly two years ago, they finally sold the names to WashingtonVC and the Internet Real Estate Group (which also owns Chocolate.com, Jeans.com, Sweepstakes.com, Relationship.com, Consultants.com, Patents.com, and others). The Internet Real Estate Group is a domain-holding company that is creating actual sites out of its most valuable domains. It had an early hit with beer.com, which it bought in 1998 from a 21-year-old for $80,000 (letting him keep a 20 percent stake) and selling it three months later for $7 million. Coincidentally, that is also roughly how much it paid in total for Phone.com and Software.com. Now Phone.com has relaunched as a low-cost VOIP phone service targeted at consumers and small businesses (starting at $17 a month for unlimited calls in the U.S.), and Software.com is a software download store. Heading up Phone.com is Ari Rabban, an executive who used to work for VOIP pioneer and Vonage co-founder Jeff Pulver. Michael Mann, the founder of BuyDomains.com (now NameMedia, which just filed to go public last week), is chairman of the board of the company, and the biggest investor through WashingtonVC, which is his incubator/investment fund. 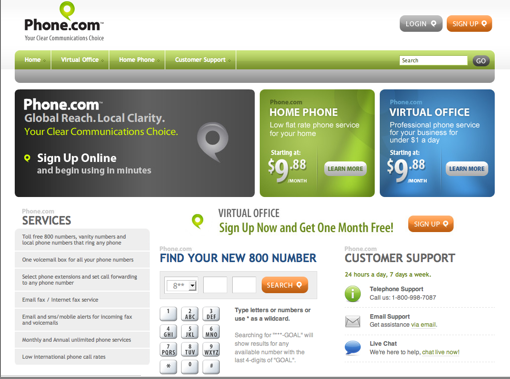 Phone.com offers what appears to be a competitive product, with advanced features such as a follow-me service and virtual extensions for small business customers. It will launch more Web telephony products soon as well to compete with the Jajahs and Jangls of the world. And with the Phone.com name, it doesn’t need to spend much money on marketing. In fact, since the service launched in late September, it has spent zero on advertising. That will change soon, but 10,000 people a month come in just through type-in traffic alone. Add in search-engine optimization, and the name pretty much markets itself.